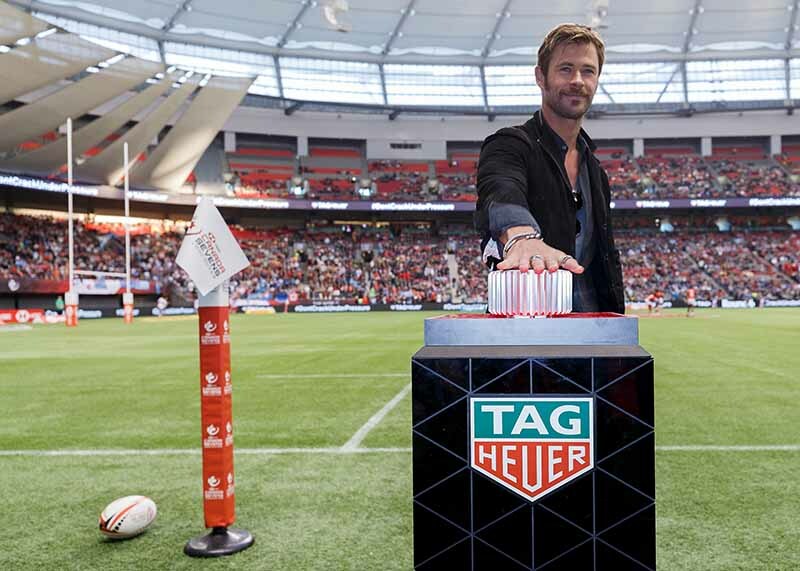 As Official Timekeeper of the HSBC World Rugby Sevens series being held in TAG Heuer tapped its Brand Ambassador Chris Hemsworth to lead the on-field countdown before the finals match on the afternoon of March 11, 2018. In addition to the countdown, Hemsworth coached a group of youth rugby players as they competed in TAG Heuer’s #DontCrackUnderPressure challenge to raise money for BC Rugby. The goal for the young competitors was to work together to see how many times they can kick the ball through the uprights in 60 seconds. TAG Heuer donated a total of $10,000 to BC Rugby where the funds will be allocated directly to indigenous youth rugby programs. BC Rugby provides free programming to youth in local communities, and positions sports as a healthy, positive alternative. Kilian Muller, President and CEO of TAG Heuer North America presented Hemsworth with a TAG Heuer Aquaracer Calbre 5 watch before the games were underway. Following the match, Hemsworth presented the same watch to Alasio Sovita Naduva, the player who best embodied the #Don’tCrackUnderPressure mentality during the final match. The HSBC World Rugby Sevens Series spans the world by holding 10 tournaments on five continents where 16 teams compete head-to-head to gain the most number of points. An overall champion is crowned at the end of the season based on points accumulated throughout the 10 events, from the opening round in Dubai in December to the final round in Paris in June. The sport of rugby requires players to possess incredible strength, endurance and the power necessary to withstand brutal physical contact while strategically moving the ball towards their goal posts. Such measured movements and strategic plays are mirrored in the mechanics of TAG Heuer’s timepieces along with the player’s mission to not crack under pressure. These similarities make TAG Heuer a natural fit as the Official Timekeeper for the HSBC World Rugby Sevens Series.